Oregon consistently outpaces the U.S. in union membership as a share of total employment. In 2017, 14.9 percent of Oregon’s workers were union members, compared with 10.7 percent for the U.S. Employees who are not union members but whose jobs are covered by union contracts slightly increased the share of union coverage beyond membership rates in both the U.S. and Oregon. The share of covered workers in Oregon totaled 15.7 percent, while the U.S. coverage rate was 11.9 percent in 2017. Comparable union membership data are available back to 1983, when union membership totaled 17.7 million nationwide and 222,900 in Oregon. The U.S. has not since matched the 1983 membership level; the U.S. coverage level also peaked in 1983 at 20.5 million. Oregon reached its highest union membership (275,300) and coverage (295,000) totals in 1994. Oregon remains among the most unionized states. In 2017, Oregon’s concentration of total union membership ranked 12th highest among the 50 states and the District of Columbia. The state’s public-sector membership (53.1%) ranked 8th highest, and the private sector’s 8.3 percent rate ranked 10th. 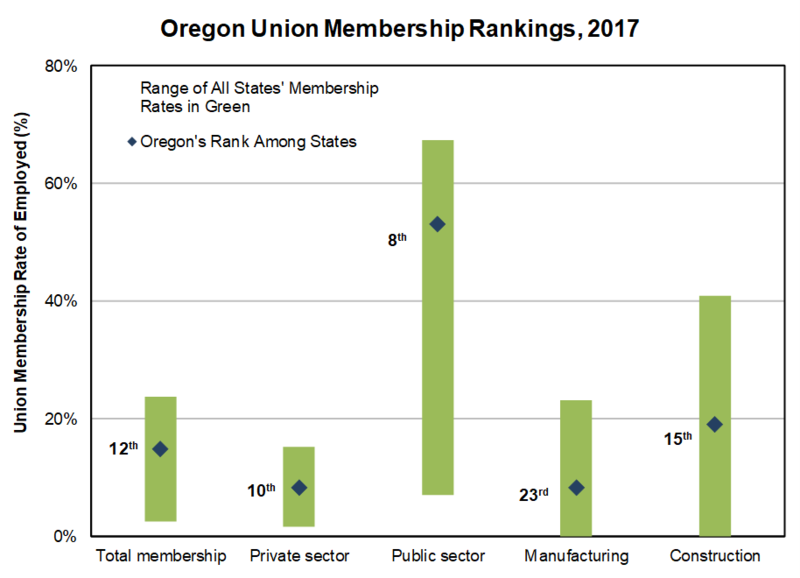 Oregon has relatively smaller union membership concentration in private manufacturing and construction compared with other states. In 2017, the union membership rate in manufacturing (8.3%) fell in the middle of the pack, ranking 23rd. In construction, Oregon ranked 15th highest among the states with 19.0 percent membership. More information on union membership is available in the full article written by Senior Economic Analyst Gail Krumenauer. Nice article, but it would be good to know why. I wonder how many of the unionized workers are State Employees which includes SEIU and teachers?